Kohli became the only the 31st player and the 6th Indian to aggregate 2000 runs in this format as a captain. Despite not having a great series against Australia so far, Virat Kohli added yet another batting record to his bag. The Indian captain across formats completed 2000 runs in ODI cricket while leading the team. Thus, Kohli became only the 31st player and the 6th Indian to aggregate 2000 runs in this format as a captain. He needed just 36 innings to complete the milestone, thus becoming the quickest to reach 2000 ODIs as a captain. Kohli broke the record of the South African captain, AB de Villiers, his teammate in the IPL franchise, Royal Challengers Bangalore. De Villiers needed 41 innings to complete 2000 ODI runs as South African skipper. Incidentally, Kohli broke the record at his IPL home venue, M. Chinnaswamy Stadium in Bangalore. He has scored just 141 runs in the four ODIs in this series so far. 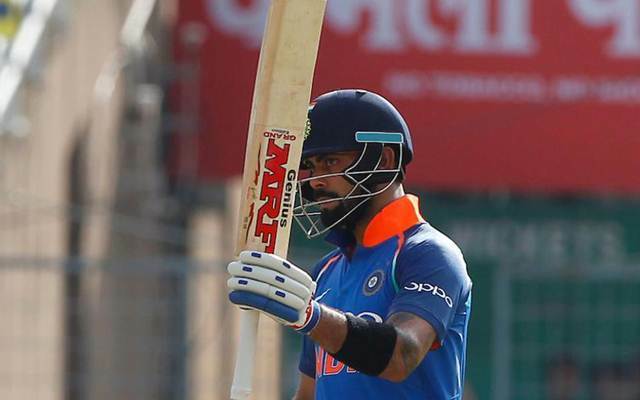 Coming into the game, the Indian captain needed 13 runs to complete 2000 ODI runs as captain, he scored 21 runs before chipping one onto his stumps. He was earlier involved in a run out of his partner Rohit Sharma, who struck five sixes in his 65-run knock. Among the five Indians before Kohli who scored 2000 runs as captains in ODIs, MS Dhoni was the quickest to reach the milestone taking 48 innings, one less than Sourav Ganguly, who required 49 innings. Kohli bettered his countryman by 12 innings. Earlier at the start of the year, the 28-year-old became the quickest to reach the milestone of 1000 runs in ODI cricket as a captain. The Indian No.3 batsman needed 17 innings to complete 1000 ODI runs as captain breaking AB de Villiers’ record, who got there in 18 innings. Among the 31 players who have scored 2000 ODI runs as captain, only seven have managed to complete the milestone in less than 50 innings. No player other than Kohli and De Villiers managed to get there in less than 45 innings.